Call it Fear of Frying. This is the second year in a row I did not make latkes for Hanukkah. The second year in a row I had a recipe at the ready, already taped to my cupboard for easy reference. The second year I had potatoes, onion, matzo meal, but no applesauce. The second year I felt the disappointed eyes of my kids and kin. All because I’m terrified of frying. That’s what it is, I’m sure. Because I really have every intention of trying my hand at this Hanukkah tradition, if only to say that I’d tried and failed spectacularly. 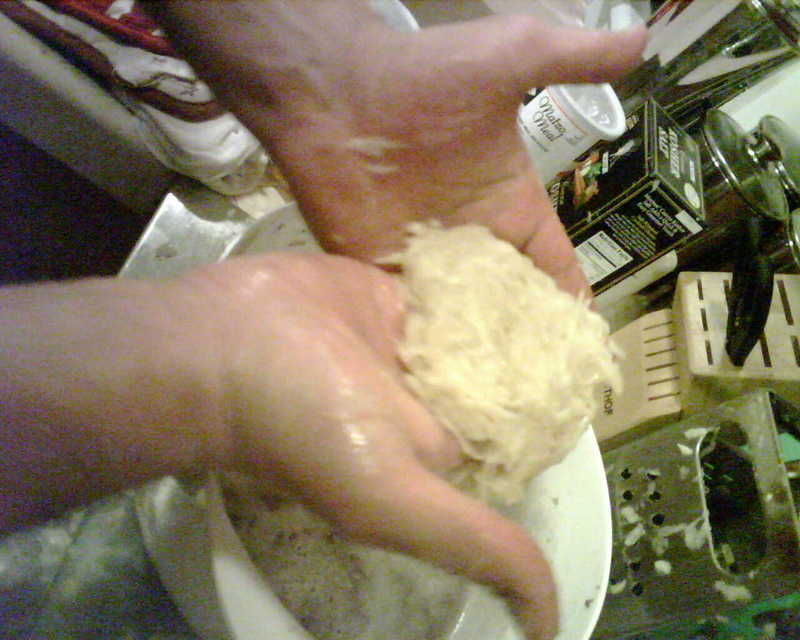 I would be in good company as well, since nobody, apparently, can make a homemade latke turn out like the ones you buy in delicatessens. But when it comes time to dump a whole lot of Canola oil into a pot…I balk. I just don’t want to go there. Two generations in Southern California and I can’t even eat a French fry without choking on my guilt. And frying anything myself? How would I get the smell out of my kitchen? And what about splatting accidents? I volunteered to make latkes for my son’s second grade class, thinking that this commitment would force me to get past my fear of frying. No such luck. Trader Joe’s was sampling its frozen latkes the day before, and I took the coward’s way out. Second graders love potato pancakes and applesauce. Especially when they think you made them yourself. As Hanukkah wore on, it became increasingly obvious that homemade latkes were not going to happen at my house. Fortunately, my friends E.J. and Marya came through with a latke party, which handily got me off the hook as far as keeping my kids in the Jew-food loop went. Eeej slapped together latkes like a pro, throwing ingredients together while chatting and drinking wine. And we ate every last one of them. His secret? “You’ve gotta squeeze every bit of liquid out before you fry it,” he says. “Or else you’re in trouble.” Hmm. That nugget *almost* compelled me to try it myself….but no. And now the Festival of Lights is over. Just for the record, here’s the recipe I was going to use. From the New York Times. In a large mixing bowl, beat eggs lightly. Add potatoes, onion, salt and pepper and mix well. Stir in two tablespoons of matzo meal, and let it absorb for a minute or so. Try to get your batter thick, but not too watery and not too dry. In a large skillet over medium heat, add two tablespoons of oil. When oil is hot, drop in heaping 1/8 cups (about two tablespoons) of batter, flattening them gently to make thickish pancakes. When the bottoms have browned, after 2 to 3 minutes, flip and brown on the other side. Add oil as needed. Drain on paper towels and add salt to taste. Serve hot with applesauce and sour cream. Makes about 24 small latkes. Does this sound like anything I’d be able to do? No way. Thank you, Trader Joe’s. Just so you know for next year: Serious Eats blogger Ed Levine tells you where to get the best of the best. Here.